July 30, 2013 / Janet Schiesl / Be the first to comment on this post! I wanted to share my renewed inspired laundry room with you. If you missed Part 1, read it here. These are the small touches that I added into the space. 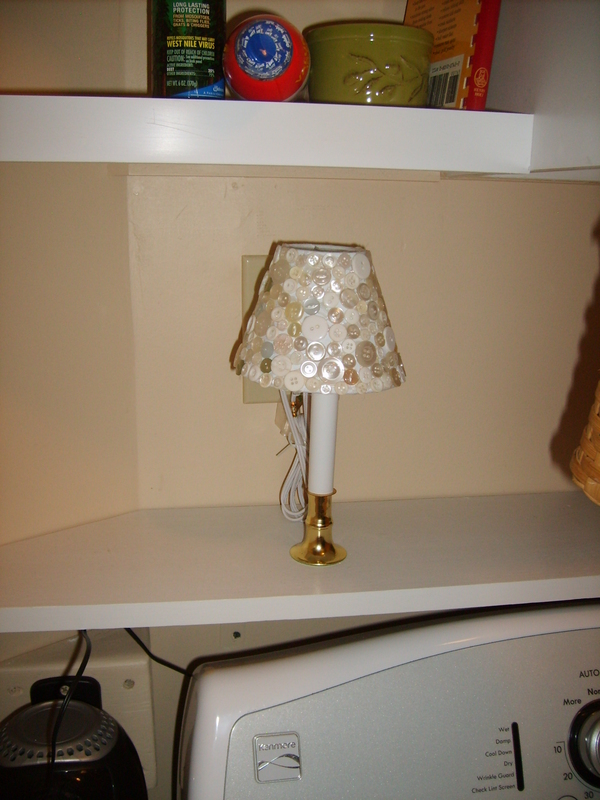 I decorated the small lamp shade with white buttons and purchased a new candle lamp. It’s great because it has a built-in timer. It goes on each evening for 8 hours. I like it because I come into my home through the laundry room and now my entrance is always lit and welcoming at night. Did you miss the yellow flower in the hanging basket on the cabinet door knob? Just a touch of whimsy. Did you see my hidden dust buster? We made good use of the small space next to the dryer. Don’t you think? Remember I said that I used to have two laundry baskets that sat on the dryer. I decided that I wanted to use the top of the washer and dryer as a drop-spot now, so I needed to come up with a basket options that didn’t take up much space. The solution came in the form of two Unhampered laundry baskets. You see, they sit on the floor in the only extra inch of space in my laundry room. Again, featured in the summer issue of Getting Organized magazine. Here’s what they look like unfolded. I love my new laundry room. It makes me happy to enter such a bright and pretty space.